A major aim of the Research Center Translational Neurosciences of Johannes Gutenberg University Mainz (JGU) is to investigate resilience, i.e., the mental ability to cope with problems and setbacks. It has thus combined all its resources in this field in the newly established German Resilience Center Mainz. Neuroscientists, physicians, psychologists, and social science researchers will work together in this new multidisciplinary institution at JGU and take an innovative approach to a field of international relevance. The German Resilience Center Mainz will close an important gap in the German research landscape and is the first center of its kind in Europe. Stress, traumatic events, and difficult personal life situations play a significant role in the development of many mental illnesses, such as depression, anxiety, or addiction. However, not everyone exposed to such circumstances will suffer from psychological dysfunction as a result. The inherent mental stabilizing capacity of each individual, known to researchers as 'resilience,' helps them effectively master challenges, stress, and difficult situations, and thus remain mentally healthy. Because some people only briefly suffer consequences or do not succumb at all even when faced with major psychological or physical stress, it seems likely that there are certain defensive mechanisms in the brain that protect the individual from stress-related dysfunction and thus help them rise above crises and adversity. In the newly established German Resilience Center Mainz, the participating researchers plan to identify the neurobiological mechanisms which prevent people reacting to stress by developing a psychological condition or disorder. Putative protective mechanisms, such as well-functioning emotional regulation and interference inhibition, will be investigated translationally on a range of neurobiological levels in order to better understand the underlying mechanisms and thus be able to develop effective preventive measures. "The new center will not only be undertaking scientific research, but will also be exploring an area of considerable societal and economic relevance," said Doris Ahnen, Minister of Education, Science, Continuing Education, and Cultural Affairs of Rhineland-Palatinate, emphasizing the importance of the German Resilience Center Mainz. "In an era in which technology, science, and society are subject to progressively rapid changes and increasing numbers of people are complaining of stress in their daily life, research into the causes of stress-related psychological dysfunction and the development of preventative programs to deal with such diseases is of particular importance. 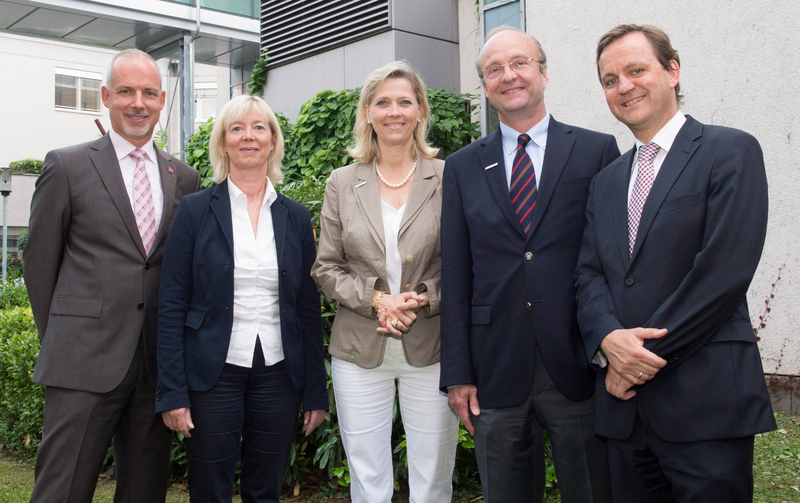 In addition, the new center not only represents a major contribution towards the study of the life sciences at Mainz University, but will also help enhance the profile of the Mainz research hub that is already taking an excellent direction thanks to the support of the Rhineland-Palatinate Research Initiative." "Cross-disciplinary prioritization made possible by the diversity of subjects found at a comprehensive university and a clear commitment to excellence – such interdisciplinary networking is characteristic of the top-level research being undertaken at Mainz University. The German Resilience Center Mainz is one example of this and will provide a major boost to the research profile of our university within the context of national and international competition," explained the President of Mainz University, Professor Georg Krausch. "In addition, the German Resilience Center will promote the flow of knowledge and current research findings in the form of tangible projects and measures into the community to help improve the quality of life of much of our population." "The German Resilience Center will become a main pillar within our Research Center Translational Neurosciences," emphasized the Chief Scientific Officer of the Mainz University Medical Center, Professor Ulrich Förstermann. "Because no systematic research into the neurobiology of resilience has previously been undertaken in Germany, this represents a major distinguishing feature of our research profile and will enhance our national and international visibility." Understand, prevent, change – these are the three core objectives of the German Resilience Center Mainz. "We want to understand which processes in the brain make it possible for people to protect themselves against the damaging effects of stress and difficult life events and discover how we can use these protective mechanisms in a targeted fashion to promote and reinforce their effects. Use of this insight to prevent psychological dysfunctions would represent a new and alternative approach. Clinical research in psychology and psychiatry has to date primarily focused on looking at the diseases themselves," explained Professor Klaus Lieb, Chairman of the Department of Psychiatry and Psychotherapy and Vice Director of the German Resilience Center Mainz, describing its underlying concept. "The close link between top-level research of international relevance and direct application of the latest findings into clinical and social frameworks within a university structure will fundamentally change how we deal with people affected by stress and psychological diseases. The center itself will provide an important point of contact for researchers, clinicians, journalists, decision-makers in society and politics, and the individuals at risk of being affected by stress-related dysfunction, when it comes to finding out about aspects of stress and resilience. Our aim at the German Resilience Center Mainz is thus not only to promote research and develop treatments. We also intend to have a widespread effect within society as a whole." For the on-going Mainz Resilience Project (MARP) as well as for the Gutenberg Brain Study (GBS), young, healthy subjects have been recruited to be monitored over a period of several years in order to document their mental health status and the stress factors to which they are exposed over time. This will make it possible to identify the mental characteristics and abilities that represent important protective mechanisms. The objective is to use this knowledge to develop effective prevention programs that will bring alleviation to individuals and reduce the associated economic and social costs.